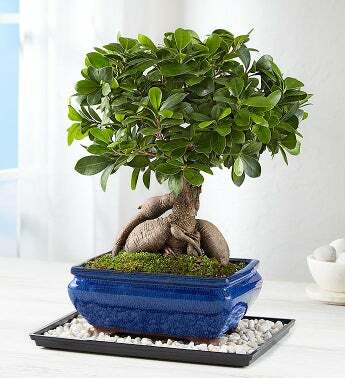 Known to embody strength and well-being, our Ginseng Grafted Ficus tree makes a hearty gesture of fondness. With sturdy exposed roots supporting its thick trunk and grafted branches full of glossy green leaves, it arrives in a complementing deep blue ceramic planter. Available in large or small, it’s a unique beauty that is sure to impress.